It's been awhile since my last post, so we have a lot to catch up on. Where to begin? With all the rain we're having, it's only natural to think about mud puddles. We have quite a few in our yard, and many more in nearby parks and roads. Where does all that water go? Eventually, it's incorporated into the watershed, where it plays a vital role in the health of the surrounding ecosystem. Because of the excess rainfall we're experiencing, the soil is saturated. Depressions that hold excess water quickly become breeding grounds for mosquitos. When the top layer of soil is washed away, nutrients needed by plants are lost. Plants that require drainage may also be lost or damaged. The sea of impervious surfaces in urban and suburban areas further prevents percolation into the ground. When rainfall continues past the saturation point, surface runoff eventually flows into streams, rivers, and on toward the ocean. As it travels across land, runoff carries herbicides, fertilizers, and petroleum toward the watershed. Excess rain also creates soil erosion along stream and river banks, which then leads to sedimentation. Silty water disrupts delicate wetland ecosystems. So what's a homeowner to do? 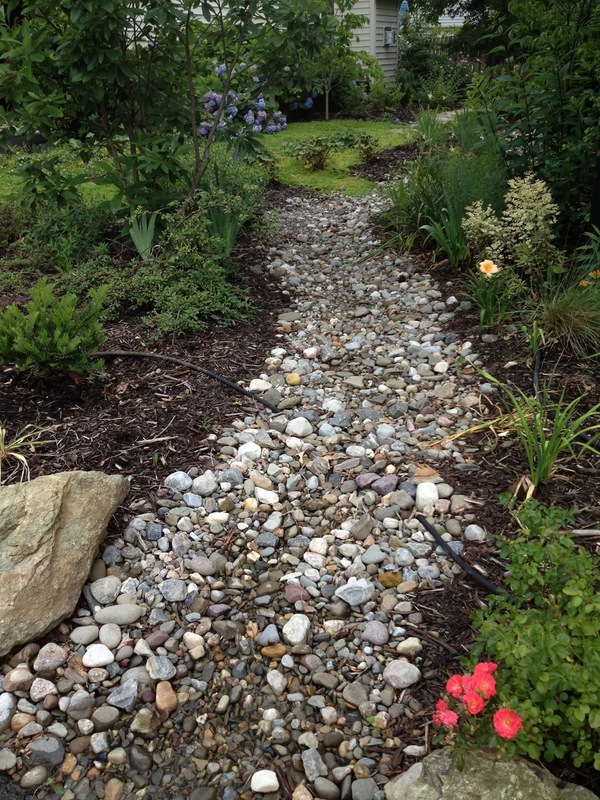 There are several options, including rain gardens, water retention ponds, and swales. We recently installed a swale in a poorly graded area of our yard. A swale slows run off by drawing water into the ground. Plants that tolerate wet feet, such as lilies, ferns, and irises grow along the gently curving stone-filled area. Instead of a soggy, boggy dead-zone, we now have a lovely permaculture feature. Another wonderful post. I think very few people really understand the importance of permeable surfaces, both to cut down on non-point source pollution and to prevent flooding problems in times of heavy rains.